The reality show vet turned body positivity advocate and charity founder sings the praises of loving yourself and helping others. 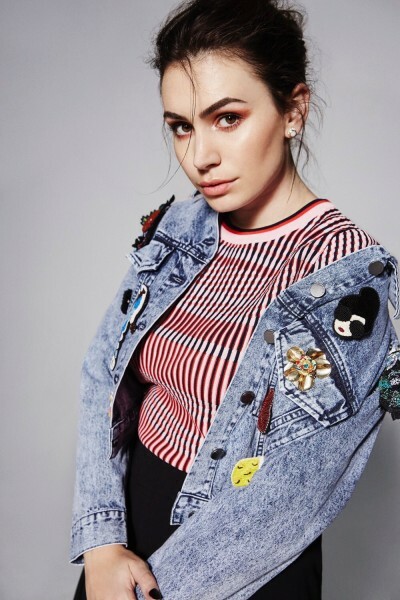 As the daughter of two famous parents (Gene Simmons of Kiss and Canadian actress Shannon Tweed), a reality show veteran and budding musician, 24-year-old Sophie Tweed-Simmons is used to the spotlight. And she’s using her celebrity to speak out about important issues. As the host of Refinery 29’s video series, Body Image School, Tweed-Simmons spoke candidly about her own body struggles while sharing industry secrets and offering useful tips to combat negative body thoughts. And when she was 18, Tweed-Simmons co-founded the children’s safety advocacy centre Sophie’s Place in Surrey, BC, which provides specialized care to young victims of physical, mental or sexual trauma. On the eve of the annual Yellow Brick Road gala for Sophie’s Place, we chatted with her about how she continues to stay body positive in the age of the selfie. You previously hosted Refinery 29’s Body Image School. Why is promoting body positivity so important to you? Body image has always been something that I’ve been aware of growing up. I was picked on for being physically different than what the majority of women in Hollywood look like, including my mom. It just wasn’t something that I was ever going to be. I have a different body type than a lot of models and actresses and I had to learn to deal with being different at a very young age. I feel like it’s now becoming this mainstream buzzword issue and I’ve been dealing with it my whole life, so I’m an expert on it. One of your videos revealed how much retouching selfies and Instagram photos go through. Do you think we will ever live in a world where retouching won’t be the norm? There will always be retouching, and it’s unfortunate, but I also forget sometimes that photography is still an art. The photographer definitely wants the photograph to look the best it possibly can, so there’s always going to be colour correcting and some airbrushing. What I try to get people to realize is it’s fine to treat your photographs like art but changing the shape of a person’s body is sending the wrong message to the audience and the model. It’s silly, really, because now that all different body types are becoming more and more accepted, excessive retouching should be less of an issue. It should be about fixing a wrinkle in the garment, not editing the person. You have a clothing collabo with the online shopping site, The Style Club, and you decided not to Photoshop the images shot for your campaign. Was that an easy decision? That was easy for me. At The Style Club, they’re real women running that business—they’re young and they go through the same body struggles that we all do. That’s why I chose to collaborate with them. They thought it would be a really cool idea and people responded to it really well. For that specific collection, we carried the biggest range of sizes that The Style Club has ever carried. It was important to have options for all. Body positivity is such an important topic. Do you have any tips on how to maintain body love? Use social media less. I find that the days when I’m feeling crappy about my body are the days when I’m on the couch looking at social media and not actually up doing things. When I’m out running errands, going to work, going to the gym or just hanging out with my friends, I have a much better sense of self then when I’m sitting at home comparing myself to photos that I’m looking at. We don’t do it consciously, but it happens when we look through our Instagram feeds and our Twitter feeds. For the first time in history, supermodels, actresses and people we look up to are in our everyday newsfeeds so we’re comparing ourselves to them more then ever. That’s just something we’re grappling with as a generation, hopefully we’ll get the hang of it and the next generation will have an easier time with it. How did Sophie’s Place come to be? The then-mayor of Surrey, BC, Dianne Watts, and I founded the centre when I was 18. The idea was to create a place where kids could say what had happened to them and get the results they deserved in a child-friendly environment. That didn’t exist before. We partnered with the Centre for Child Development, which is a mental and physical rehabilitation center for children. The most targeted group for abused children are actually children with disabilities, so it made sense that we partnered with them and build on top of that centre. What makes Sophie’s Place so special is that everything is built into our office so the children don’t have to be shuttled around to adult places. The police department, a lawyer’s office and hospitals can seem like big, scary, adult places that children go after they’ve been abused and, because of that, their stories can get changed. They feel a sense of embarrassment and shame, which they shouldn’t feel, and it’s a scary thing. So we have offices at Sophie’s Place for each member of the team that takes on a child’s case: RCMP officers, firefighters, lawyers and therapists. What inspired you to create this safe space for kids? I had always worked with children. That’s something that my parents really instilled in me and my brother, which was evident throughout our time on the show: my parents are very philanthropic. They’re involved in a lot of different organizations, but one of the ones that they pushed me to be involved in when I was younger is this community involvement program through my middle school and high school. Basically, you wrote an essay to get into this program, which then sent you to different countries around the world. [There] you would live with a home-stay family, completely immersed in the culture. We worked in orphanages, and I saw that a lot of the children in orphanages were there because they either had disabilities, were abused, or had run away from their abusers. I felt like it was such a clear problem in all these countries, then when I came home it wasn’t a problem that we talked about here. I knew it existed, but there’s this shame built around child abuse; it’s a terrible, awful thing, but it’s something we need to talk about. I saw that these other countries had amazing infrastructures for kids that were abused. There was a sense of community around abused children and an ease about talking about the subject that we didn’t have in Canada. You’ve recently ventured in a new direction: music! Has it always been a passion of yours? I’ve been writing songs since I was 10 years old but I always stayed away from music because I didn’t want to be compared with my family. I wanted to establish myself on my own first, before I went back and tried to conquer it. I think I did a good job of establishing who I am through the body positive movement and through Sophie’s Place, so now I get to go back and revisit something I’ve loved my whole life, which is music.